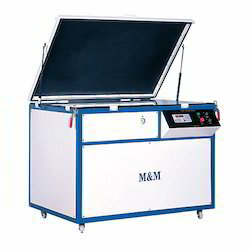 Pioneers in the industry, we offer hi-spec screen exposure system from India. We are one of the prominent organizations involved in offering a wide range of Screen Exposure Systems. Manufactured using the high-grade raw material, the range we offer is flawless performance and energy efficiency. The elastic, non-reflective blanket in the system assures perfect contact between the positive and screen mesh. Screen Frame Size 32" x 49" 32" x 49"
Vacuum Frame Size 37" x 54" 37" x 54"
Overall Size 60" x 40" x 43" 60" x 40" x 43"
Looking for “Hi-Spec Screen Exposure System”?